SOCOM utilizes a rank structure from a Biblical standpoint that uses a hybrid of WWII and modern US military ranks. We employ the ranks of Private through Specialist as standard enlisted ranks and can be held by both male and female recruits. NCOs are senior enlisted members that hold command positions on the squad level and up. Technicians are senior enlisted members that specialize in a particular area, but do not hold command of a unit. Technicians can be part of a squad or be utilized within a Command Post. They may also lead training or certifications in their area of expertise. Officers head or assist in Command Posts for the Division Headquarters. The General officers and Senior Command Sergeant Major position for the Division HQ are reserved for men only. 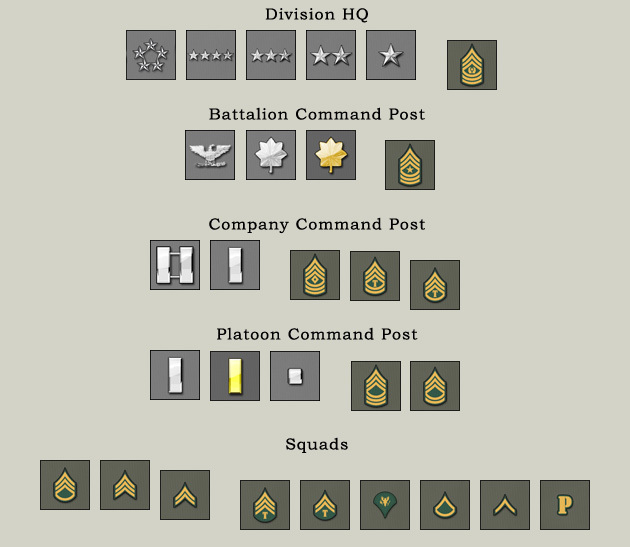 SOCOM is organized on a Battalion Structure. The Generals in the Chiefs of Staff who head SOCOM and are considered "Division HQ". They are assisted by a Command Sergeant Major. Each Battalion is led by Colonel, Lt. Col or Major who is assisted by a Sergeant Major and answers directly to the Chiefs of Staff. Each Company within the Battalion is led by a Captain or 1st Lieutenant and assisted by a First Sergeant. Each Platoon within the Company is led by a 1st Lieutenant or a 2nd Lieutenant and assisted by a Sergeant First Class or Master Sergeant. Each Squad within the Platoon is led by a Staff Sergeant or Sergeant and assisted by a Corporal. Most members within SOCOM are in the squads and are the responsibility of the Squad leader. The four lowest ranks, from Private to Specialist, are known as Lower Enlisted Soldiers. While NCOs supervise a task being done, lower enlisted soldiers are the ones who actually do the job. Below is list of the Enlisted ranks with the name of the rank, abbreviation, and how to address each rank. A Private is the lowest rank in the SOCOM Army. Being the lowest rank often means that a PVT will be picked for details and other duties. The best way for a Private to get noticed and rank up is to study hard, word hard, be on time, and stay motivated. A Private might also be called "Fuzzy", "E-Fuzzies", and "E-Nothing" because they have no insignia leaving the fuzzy Velcro where a rank patch should be. This is the first rank and position in SOCOM. At this rank you are now a member. A PV2 has basically the same duties as a Private. To become a PV2, a Private must have served a minimum of 6 months or get a waiver from his or her commander. Merit rank given to the best Privates. PFC's can have many duties depending on their unit and how squared away of a soldier they are. In order to get promoted to Private First Class, a PV2 must have time in service and show great performance. This merit rank is given to the best PV2's. Specialists have more duties and a lot more expected of them, because they are on their way to becoming NCO's. A squared away Specialist can perform some of the tasks of a junior NCO. A PFC can become a Specialist after sufficient time in service and show great performance. This merit rank is given to the best PFCs. Sometimes serve as Fire Team leaders, so this may be considered a command position. At this rank, you may lead under the instruction of your Squad Leader and you may take on responsibilities delegated to you by your Squad Leader. A minimum of one advanced certification is a prerequisite to attaining the rank of Specialist. Is a Tech Equivalent to a Sergeant? On January 8, 1942, Technician Third Class (T/3), Technician Fourth Class (T/4), and Technician Fifth Class (T/5) were added to the rank insignia. On September 4, 1942, a "T" was added to the standard chevron design that corresponded with that grade. A technician was not addressed as one such, but rather as the neighboring rank in its pay grade (T/5 as Corporal; T/4 as Sergeant; T/3 as Staff Sergeant; TSG as Sergeant First Class). A technician did not have the authority to give commands or issue orders. This is the first Technician rank of SOCOM and is held by senior female enlisted only. To receive this rank, a specialization must be decided upon and finalized. Technicians can be many things. This rank functions within a squad and is subordinate to NCOs unless designated by the Squad Leader as a 2nd in command. Soldiers in this position will be called on to complete specific and detailed tasks within SOCOM, above and beyond that expected of an enlisted trooper. Occasionally this rank may be utilized as a fire team leader specializing in a specific task. A T/5 can be expected to train soldiers and teach certifications in their field under the direct supervision of the training staff. The same technician functions apply to the Tech 4 as the Tech 5. However, at this rank it is expected that a T/4 be able to lead a small team in order to accomplish a specific task. This rank is senior to all enlisted ranks and the T/5. Sometimes this rank will be designated as 2nd in Command of a squad by a squad leader, but under normal circumstances will be subordinate to Corporals. These experts will hold certifications to certify soldiers in tasks of their specialization. A T/4 can be expected to train soldiers and teach certifications in their field with minimal supervision of the training staff. Merit rank for the most effective Tech 4's. In addition, Tech 3's will serve as technical experts who hold training in a specific field for members of their platoon/company. These experts will hold certifications to certify soldiers in tasks of their specialization. Tech 3's will function within squads under a squad leader or at Platoon/Company CP. A T/3 can be expected to train soldiers and teach certifications in their field with almost no supervision of the training staff. Technical Sergeants will head small specialized units within a Company/Battalion. For example, Technical Sergeants could serve as Company or Battalion adjutant in charge of training a specific field or in charge of communication between the ranks. Non-commissioned Officers (NCOs) are the most important part of the SOCOM Army; without them the SOCOM Army would not be able to function. NCOs are involved in every part of the SOCOM Army, from leading daily prayer to carrying out a mission. For this reason, Non-commissioned officers are often called "the Backbone of the Army." Unlike Officers, NCOs are always on the ground with their soldiers explaining what the task is and ensuring the task is finished to standard. Some of the responsibilities of an NCO are leading prayer, training soldiers, conducting inspections, disciplining soldiers, completing missions, and supervising soldiers in any kind of duty. NCOs also must be accountable for their soldiers' actions and be an example for other soldiers to follow. Non-commissioned Officers will be around you throughout your military career, from your Drill Sergeant in Basic Training to your first line supervisor in your unit. These soldiers have studied hard, trained hard, and worked hard to become NCOs; so always make sure you show them the respect they deserve. Although they are on the same pay grade as Specialists, Corporals have a lot more responsibilities. Corporals are Junior NCOs which means that they have the same authority to manage soldiers as a Sergeant. Usually, a Corporal will be in charge of a Team of 4 - 5 soldiers. A Specialist (and sometimes a PFC) can be promoted to Corporal by studying, being a squared away soldier, and showing leadership skills. This is the first official command rank in SOCOM. Corporals are expected to uphold all the ideals of the SOCOM ministry and are required to pass a "Corporal Test" even to be considered for the rank. At this rank one normally serves as Squad XO (Executive Officer, aka 2nd in Command), but may also serve as a Fire Team Leader or even Squad Leader temporarily in the absence of a Sergeant. Sergeants play an important role in all aspects of the Army. Being a first line supervisor, a Sergeant has a lot of influence on his or her soldiers and has a variety of duties including training, inspecting, and disciplining them. A Sergeant manages a Squad which is about 9 - 10 soldiers. Most Sergeants will be Squad Leaders. Sergeants/Squad Leaders are some of the most important people in SOCOM and only the best and most accountable Enlisted soldiers will become Sergeants. Sergeants keep their subordinates active, run practices, use tactics with their squads and follow the orders of their Platoon Sergeant and Platoon Leader. A Sergeant is responsible for the actions of their subordinate squad members. Squads are the basic tactical unit in SOCOM and a Squad Leader is responsible for making their squad a tactical advantage in combat. Some Sergeants may serve as administrative staff for Officers, but most are squad leaders. A Staff Sergeant can have the responsibility of an entire Platoon (25-40 soldiers) or, like a Sergeant, be in charge of a Squad. Because Staff Sergeants have much more time in service and more experience they are usually responsible for more military items and equipment. Merit rank for Sergeants. The most experienced and veteran Sergeants will be Staff Sergeants. A Sergeant First Class is a Platoon Sergeant meaning that he or she will take the orders that are put out by the Platoon Leader (an Officer) and ensure that the Platoon properly carries out those orders. This is the Platoon Sergeant rank. Platoon Sergeants serve as the right hand man to the Platoon Leader (normally a LT) and are responsible for organizing the squad leaders under their command. This rank is sometimes given as a merit rank for squad leaders that retain their squad leader position. Depending on an NCO's MOS, he or she can be promoted to Master Sergeant. A Master Sergeant has more administrative duties and less authority than a First Sergeant. In SOCOM, this rank is sometimes given as a merit rank for squad leaders or platoon sergeants to retain their position. A First Sergeant is responsible for managing an entire Company of 100-200 Soldiers. First Sergeants must keep their Companies performing to the best of their ability by ensuring that orders or information from the Company Commander (an Officer) or higher is given to the Platoon Sergeants who give it to their soldiers. Every First Sergeant wants his or her Company to be the best. To accomplish that, First Sergeants ensure that their Company is well trained, fit for duty, and doing their duties properly. Sometimes a First Sergeant will be referred to as "Top." Company First Sergeant serves as the NCO assistant to the Company XO and CO. It is an administrative position and only one person per Company can hold this rank. Just as a SFC or a First Sergeant manage their Platoon or Company, a Sergeant Major must control a Battalion with 300 - 1000 through enforcing orders, organizing training, and holding accountability formations. Soldiers at this rank serve on Battalion staff as the NCO assistant to the Battalion XO and CO. The main duty of the Sergeant Major is to assign newly graduated Privates to squads. Command Sergeant Majors work at different levels in a unit representing soldiers, advising the Officers above them, and providing leadership to a Battalion or a higher unit. This is the highest rank attainable for an NCO. In the event of multiple Battalions/Divisions, the Command Sergeant Major assigns newly graduated Privates to a particular Battalion/Division and then the Sergeant Major of that particular Battalion/Division assigns the Privates to squads. The Command Sergeant Major is the enlisted assistant and advisor to the Chiefs of Staff. Commissioned Officers are the Army's leaders. They are responsible for the management and leadership of an entire unit. No matter what rank an Officer is, he or she has basically the same responsibilities: make precise decisions, keep their unit organized and running efficiently, look out for the welfare of their soldiers, ensure that any mission is completed successfully, be a leader for other soldiers to look up to, and live the SOCOM Army Values. Officers work at the top leadership level of their unit, whether it a platoon or a division, ensuring that orders and missions that are given to them are executed by their NCOs and soldiers. "Recruit" rank for potential Officers. In order to make sure the Officers of SOCOM are dedicated and accountable, potential Officers must complete OCS (Officers Candidate School) and prove that they are the right person for the job. Members at this rank are to be treated as an Officer and normally hold all the rights of an Officer, but do it on a trial basis pending the completion of their OCS. This is the first official Officer rank in SOCOM. Normally serve as Platoon leaders. First Lieutenants have more experience than Second Lieutenants, and are usually promoted to their rank after about 18 months in Service. Since a 1LT has more experience, he or she might be put in the position of Executive Officer (XO) for a Company. Merit rank given to the best 2Lts. Normally serve as Platoon leaders or Company XO's. A Captain is usually a Company Commander, managing 100 to 200 soldiers. Normally serve as Company Commanders. In SOCOM, Majors normally serve as Battalion Staff or Battalion XO's. Normally serve as Battalion XOs or Battalion CO's. Merit rank for the best Lieutenant Colonels. Normally serve as Battalion CO's. First General rank. Generally a member of the Chiefs of Staff. Merit rank. Generally a member of the Chiefs of Staff. Chief of Staff position. The Chiefs of Staff are the top decision makers of SOCOM and oversee all the large decisions. The General of the Army is a special rank that is used as the top rank in SOCOM and is permanently reserved for our commanding officer Jesus Christ, who serves forever as Commander-In-Chief, AMEN!